Delivered within 3 working days! Crafted by us, Configured by you - The Tiger™ Flex Apex garden shed is a truly unique building which allows you to choose where you put your door and windows giving you the flexibility to have it exactly how you want it. 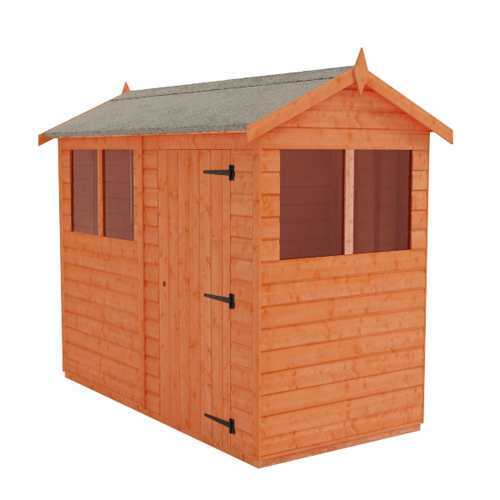 Great quality shed (albeit a couple of split pieces of wood), seemed easy to erect. Would use again. Turned up very quickly. Easy to assemble. Good quality. Very pleased with the shed and the price the men erecting it were quick and efficient so good job all round. 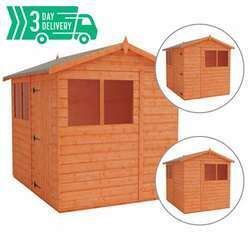 I brought a 6x4 flexi shed and its great ! Although a piece was missing it was swiftly sent and arrived the next day. 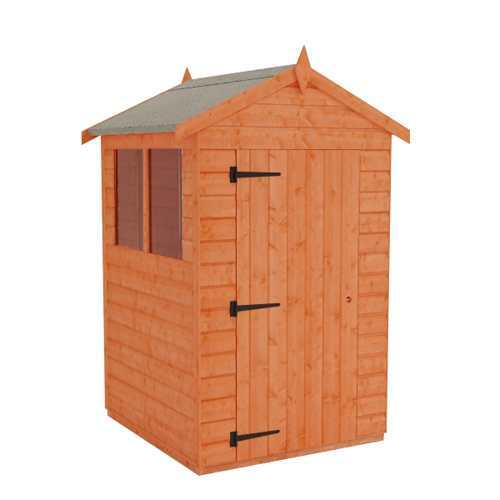 The shed is very solid and easy to assemble , much better than ones available from the usual high street DIY outlets. 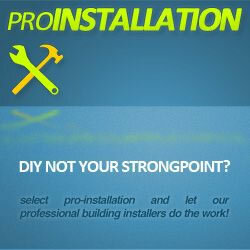 In short , excellent product , great customer service and a reasonable price. Next doors cat approved by sitting on the roof whilst we were fitting it ! From order to delivery it was 3 days. 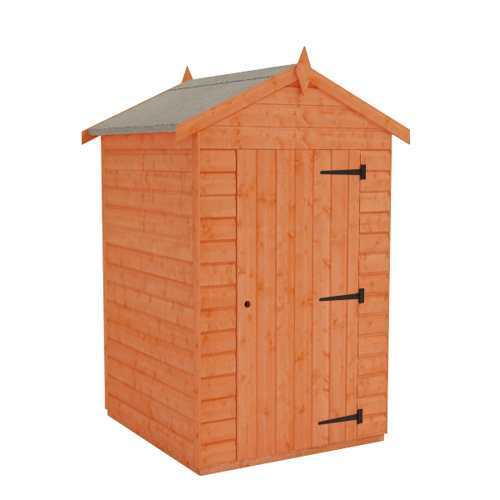 The shed is excellent value and I would definitely recommend. Great value and timely delivery. Just a few nails that missed the wood and stuck out on the prebuilt panels, but easily removed and replaced. Some of the supplied fixings could do with being a few mm shorter as they are longer than the pieces being joined/connected, again a quick dremel later and all ok. 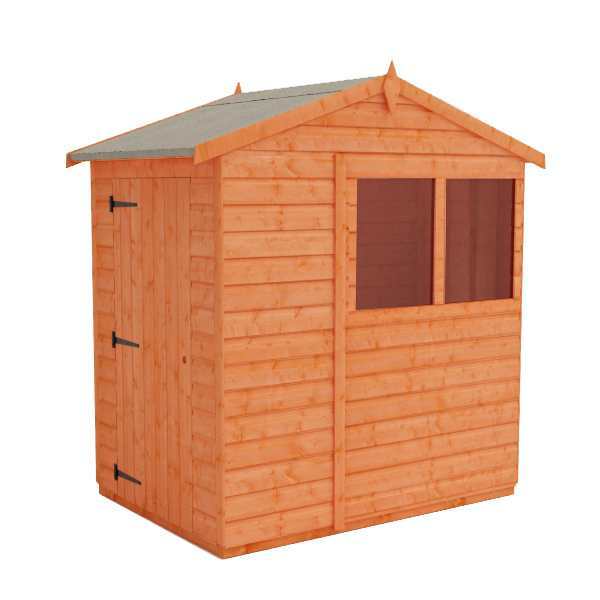 Shed is excellent quality, very well made and smooth finish. The only thing I added was some sealing tape around the windows. Otherwise very good value for the product. From order to delivery fantastic service, quality very good. Crafted by us, configured by you – The Tiger™ Flex Apex garden shed is a truly unique and flexible building where you can choose exactly where you want to position the door and windows. The panels are modular allowing you to fit each panel on any side in any position and the door can be hung either right or left hinged. Despite the modular design, quality is not compromised. The superior grade shiplap cladding is 12mm thick and the extra thick 44x28mm framing ensures the building is strong and lasts the distance. The building comes with extra high eaves ensuring there is ample height within the building so most people won’t have to stoop when inside. The shed sits on floor joists to lift the building off the ground but is still covered on each of the four sides to stop anything from getting in and under the floor. There is also heavy duty green mineral roofing felt with the shed as standard to protect it from the elements and facias, bargeboards and corner strips finish off this attractive garden building. 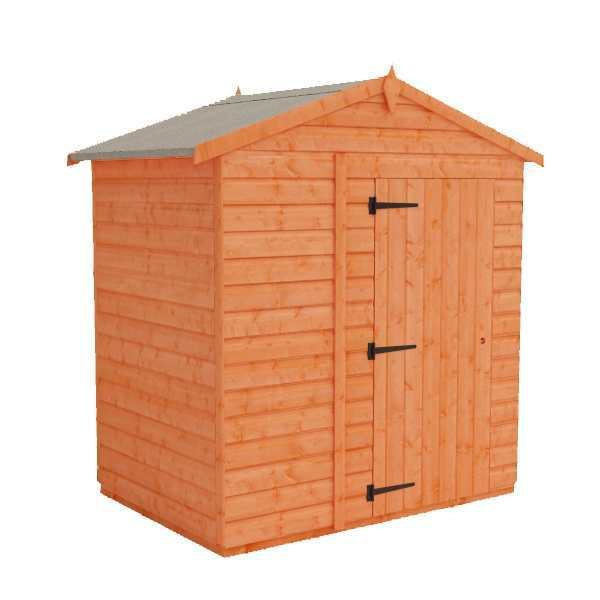 THIS FLEX APEX SHED is clad with high grade 12mm finish shiplap tongue and groove cladding – beware of shiplap sheds that feature poorly finished rough edged boards milled out of inferior timber often with a thinner finish. 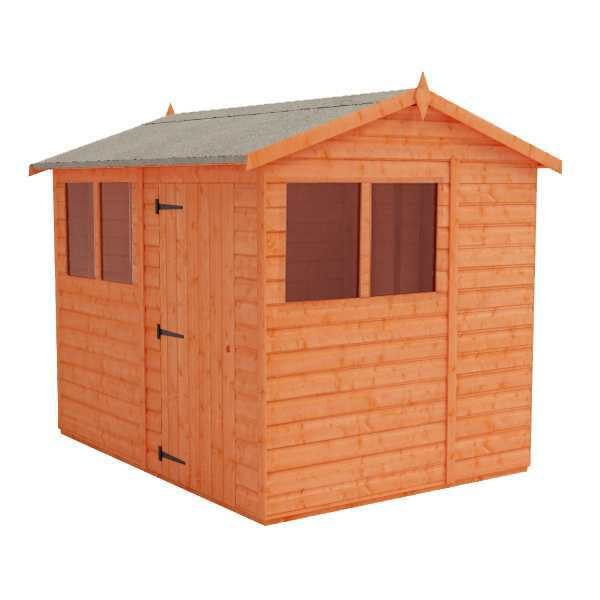 THIS FLEX APEX SHED features heavyweight ‘rounded 4 corner’ 28x44mm finish framework throughout giving it the strength to last – beware of shiplap sheds that use rough sawn ‘matchstick thin’ framework that barely hold the shed together. 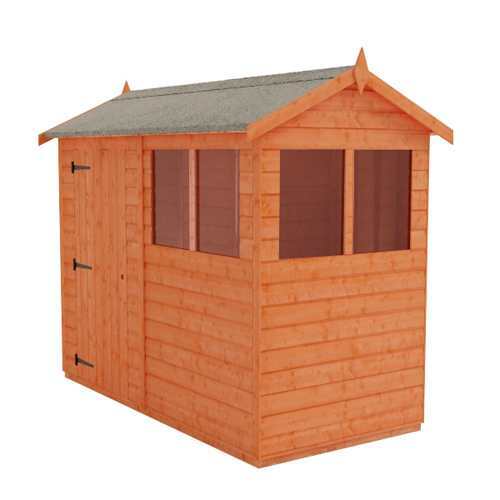 THIS FLEX APEX SHED features thick tongue and grooved floorboard in the floor and roof sections and contains NO cheap sheet materials such as OSB or chipboard – beware of shiplap sheds that use single piece OSB / chipboard roofs that offer little protection in the areas where you need it most. 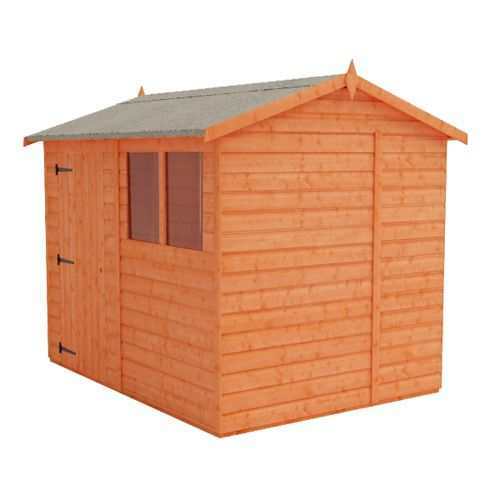 THIS FLEX APEX SHED retains our extra high ridge height – beware of shiplap sheds that are incredibly low making it difficult to stand up inside.